Frances has just started developing a new body of paintings wherein she records the experience of travelling outback kilometers on a motorbike. At the close of each day the exhilarated mind recalls the landscape as a blur of colour, light and shape. She received first prize at The Riseborough Annual Acquisitive Art Award this year, 2010. 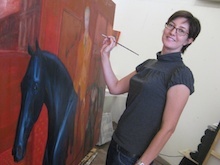 Lauren is working on a body of work for her exhibition at Gallows Gallery, Mosman Park at the end June 2011. She continues to exhibit at Margaret River Gallery. Sarah re-joined the studio in April after a 3 year absence, (getting married, moving to Vic, having a baby) and produced a number of works based on northern landscapes . With baby number 2 being born in July this year, Sarah has been somewhat distracted and plans to get back in the studio regularly in the New Year. Upon his return from overseas and interstate, Graham concentrated on his popular community classes, and giving a dozen workshops in WA. Teaching himself how to edit, he created a 4 DVD event record thank you for each of the other 20 US Paper Clay Symposium presenters. He also responded to requests for text/images from US (x2), Israel, Spain, Italy and UK (x3) journals and book publishers. Carol has had a busy year exhibiting. In March she exhibited at the "Art Melbourne" in the Exhibition building with Paola Trevisan who came out from Italy and had a large stand there. Also in Bologna, Cossack Shire Roebourne, Cancer Council Fremantle, Reisborough Art awards and her first Solo exhibition at the Westpac Bank in East Perth.